Wall Street’s disclosure of European pay practices combines the useful and the useless. For the first time, banks had to say how many staff based in the region in 2014 earned over 1 million euros. The answer: 1,107 employees for the five largest American investment banks, ranging from 164 at Bank of America Merrill Lynch to 292 at JPMorgan, including its asset management business. That’s hardly revelatory. Yet one idea – JPMorgan’s ability to cancel bonuses if a long-term return target is missed – could help transform pay policies. Curtain-twitching bonus watchers may fixate on the headline numbers. These show that the banks in total had 2,509 risk-taking or risk-management staff in Europe, earning an average of $1.5 million. The stingiest, relatively, were Bank of America Merrill and Citigroup, which paid these so-called code staff an average $1.2 million, according to Breakingviews calculations. At the other end of the scale was Goldman Sachs, dishing out more than $2.2 million on average. The headline figures are interesting enough. But the actual metrics on which bonuses are determined and put at risk are more telling. Goldman Sachs’ focus on keeping payouts low when revenue falls is in evidence, though it also stresses that final decisions made by its compensation committee are entirely subjective. Other measures it considers include “franchise accretion” and “principalling”. Jargon translation: taking market share and getting big investors to throw down. Yet JPMorgan provides the real eye-catcher. Jamie Dimon’s outfit says it can rub out the stock component of a deferred bonus if the group as a whole fails to meet a 15 percent cumulative return on tangible common equity in the preceding three calendar years. Though a return on tangible equity equates to a lower return on common equity, the principle is important. The main problem with bonuses since the crisis has been that banks have paid them despite being miles away from generating economic profit. Finally, here is a big bank that is being explicit about the link between the long-term performance of the group and the bonuses due to its staff. Bank investors should cheer and rivals should follow suit. 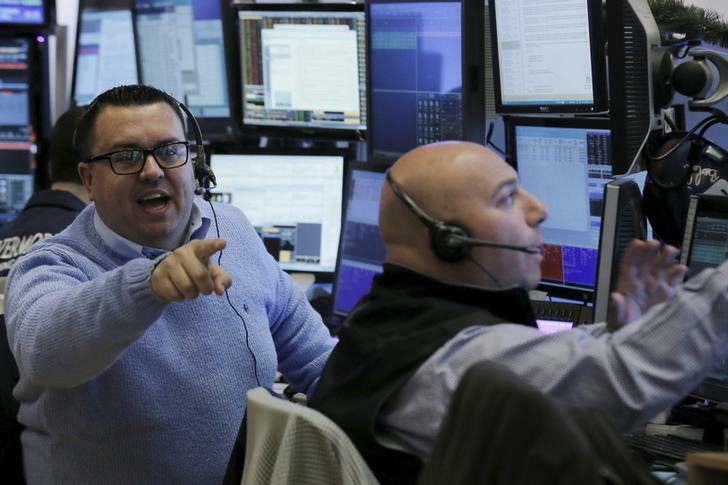 Traders work on the floor of the New York Stock Exchange January 5, 2016. America’s five largest investment banks employed 1,107 staff in Europe who earned more than 1 million euros in 2014, disclosures from the five banks show. In total, Bank of America Merrill Lynch, Citigroup, Goldman Sachs, JPMorgan and Morgan Stanley had 2,509 so-called code staff in the region, employees whose aggregate pay must be disclosed to regulators on account of their roles in risk-taking or risk management. They earned $1.5 million on average, according to Breakingviews calculations based on the disclosures.